Back when I was in bike racing shape I never dieted. Instead of dieting, I was super conscious about keeping track of what I put into my body for meals and snacks. Just the act of keeping track made me make better decisions about food and drinks. This week’s challenge is to start keeping track of what we’re eating and drinking. I’m intentionally not saying “go on a diet.” Instead, try just keeping track of food and beverage consumption. To keep track of what I’m consuming, I’m using an app called My Fitness Pal. A bunch of people have recommended it to me over the last few months. I tested My Fitness Pal and like how easy it is to look up foods and log them into my account. It will tell you the calorie count of each food. Again, I’m not concerned about the calories as much as I am the act of logging the food to create a consciousness about food choices. If you don’t want to use an app to track food consumption, a simple Google Sheet or Excel sheet is sufficient. On a related note, here’s a video from Global Cycling Network about the top foods for cyclists to eat. It should be noted that much of it could apply to runners too. Requisite disclaimer: I’m not a medical or fitness professional. Please consult your physician before beginning any new diet or exercise regimen. Ed Tech Fitness Challenge of the Week – Planks! Last week’s Ed Tech Fitness challenge was to complete ten burpees per day. How did you do? I cracked and missed a day last week. 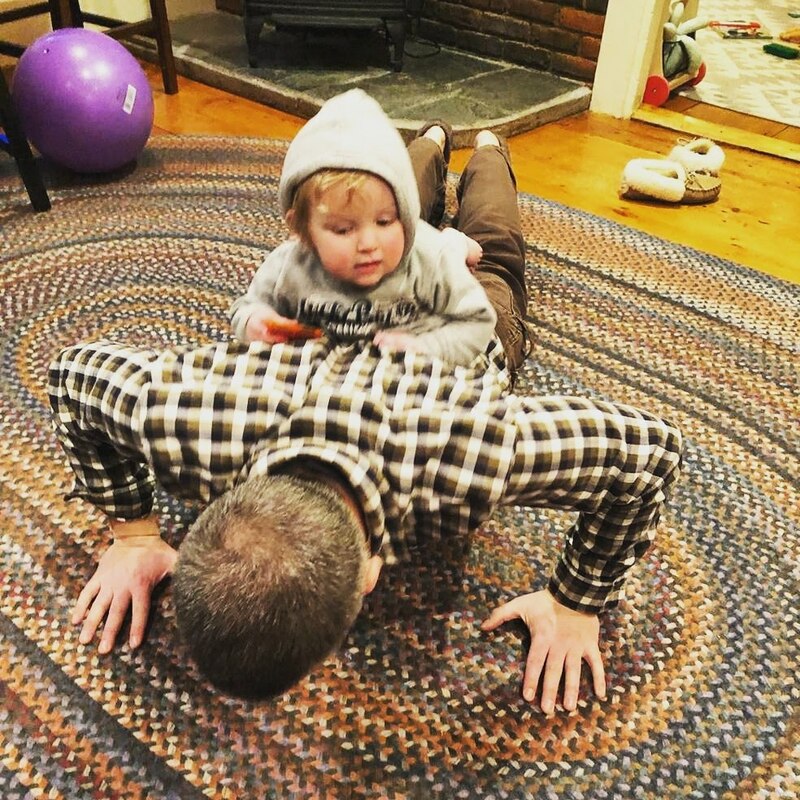 I got back after it the next day though and finished the week on a high note with a fantastic workout on Saturday afternoon and a great morning of skiing with my two-year-old daughter. Let’s continue strengthening our cores this week by doing some planking! Planking is a core exercise that you can do just about anywhere and without any special equipment or clothing. Try doing five repetitions of planking twice per day this week. You decide how long you need to hold a plank based on your current fitness. Some of us might only be able to hold a plank for 15 seconds before we need to take a break. Others of us might be able to hold a plank for a minute or more. Do what you can to the best of your ability without risking injury. The classic plank is to support yourself on just your toes and forearms/elbows like this. You can modify the plank to fit your needs. One variation is to plank from your knees. Planking from your knees can reduce some of the stress on your lower back. Another variation is to do a side plank. Here’s a good overview of how to do a basic plank and here are some variations on planks. A couple dozen of you took me up on the offer for free stickers. If you asked for one and didn’t get it yet, it’s on the way as I put a handful of envelopes in the mail this morning. I have about twenty stickers left. If you want a sticker, just send me an email with your mailing address (U.S. only, sorry). One person took me up on the tee-shirt offer so I have four more to give away. If you want one, complete this week’s challenge and post updates on the Ed Tech Fitness Flipgrid throughout the week. Good Luck with This Week’s Challenge! If you have suggestions for future challenges, please feel free to share them with me. As always, please consider your current fitness level before embarking on any of the Ed Tech Fitness challenges. I am not a medical professional. Consult your physician if you have any questions before beginning a new exercise or fitness regime. One Month Down, How’s Your New Year’s Resolution Going? On Monday night I posted on Instagram that I nearly gave in to the temptations of a zillion justifications to not get on my bike despite the fact that it sits in the trainer just three feet from my desk. But I pushed through and at 8:40pm I climbed on for a 25 minute spin session. It was the proudest moment of my 2019 and I felt about a ten zillion times better for having done it. It was the 21st time in 29 days that I got in a spin session on the bike. On the other days I’ve either skied, snowshoed, or done the NPR workout. Without a doubt writing this blog and posting on the Ed Tech Fitness Flipgrid is the biggest factor in keeping to my New Year’s Resolution to improve my health. If you need help staying motivated, try joining the Flipgrid or doing something like putting an accountability chart on your refrigerator. “Improving fitness” is a broad and seemingly never ending goal. In fact, it can feel overwhelming to think, “I have to do this for the rest of my life.” I’m not thinking of it that way. Instead I’m focused on the small things that I can do to improve my health. That’s the whole idea of the Ed Tech Fitness challenges. They’re not huge, “change your life now” type of challenges. Instead they are small challenges that you can do for a week to improve some aspect of your physical or mental health. Mixing in different types of activities and challenges prevents some of the boredom that can creep in when doing the same exercise over and over again. Even when I was riding my bike 300-400 miles a week I would get bored and seek new routes just to change the scenery. I had some Ed Tech Fitness stickers made. They look like the one in the picture above just not pixelated like in the picture. If you have a United States address and would like one, just send me an email richard (at) byrne.media and I’ll drop one in the mail for you. I have a few dozen left as of this morning. How’s Your New Year’s Resolution Going? How did you do this month? What’s your goal for February? Leave a comment below or post on the Ed Tech Fitness Flipgrid.